Movie Night: Be afraid, Be very afraid! This week's review is of a classic film from the eighties that was a remake of a film from the fifties. 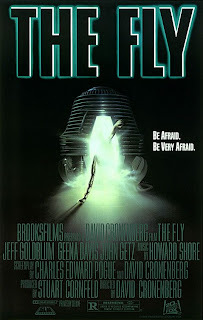 The Fly is a movie about a scientist who starts to transform into a fly after his teleportation experiment goes horribly wrong. This basic plot is all that was used from the original 1958 film. 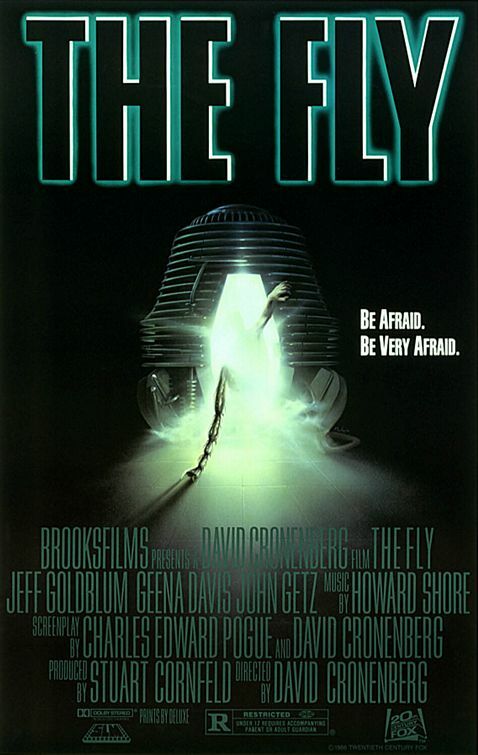 Jeff Goldblum stars along with Geena Davis in this film by David Cronenberg. Goldblum plays Seth Brundle the scientist that is transformed into a fly and Geena Davis is a reporter for a science magazine who is intrigued with Brundles experiments and also with Brundle himself. I just recently watched this film and though I have seen it before, I had forgotten a lot of it. So it was almost like watching it for the first time all over. I really liked the effects in this movie and can see why the FX artist won an academy award for them. I love movies that rely on real visual effects and not just CGI. Of course this movie was made back before CGI was used as heavily as it is now. Cronenberg is known for his body horror films and this is definitely one that can be classified as body horror. Some even say it is just a gross out film, I have to admit there are definitely some sick effects in this movie. If you have a week stomach I don't recommend this movie at all. Goldblum's performance is quite amazing and you can tell he really takes the role of Brundle seriously. Geena Davis also offers a superb performance but has to take a backseat to Goldblum. Cronenberg calls this film an "Operatic" Love story, and I have to say he is quite right. If you are looking for an amazing sci-fi horror film from the eighties be sure to give this one a try. Don't forget to visit me on twitter for news and updates on new and classic films. I just recently watched this as part of my Cronenberg marathon. I really enjoyed it, and I think its one of the better 80's horror films out there. The story is both intriguing and sad as we see this talented scientist become a little too sure of himself, and transform into this desperate being trying to cling to humanity. As his body begins to change he must rely on irrational instinct. Great performances (especially from Goldblum) and plenty of blood! Nice review! Thanks! I really agree with you on Goldblum's performance, quite amazing. I'll have to check our your Cronenberg marathon post.